When it comes to global trade flows, the world is still far from flat. What kind of trade barriers explain the ‘missing trade’ (Trefler 1995)? Economists have recognised that indirect barriers are more important than direct trade (e.g. tariffs), but the precise nature of these barriers are still poorly understood (Anderson and van Wincoop 2004, Head and Mayer 2013). Recent research has emphasised information frictions as a potential explanation (Allen 2014). Information is essential for the efficient functioning of markets, but in reality it is often limited or costly (Stigler 1961, Jensen 2007). For example, exporting firms have to spend considerable time and money to learn about the preferences of consumers in foreign countries, and, despite this, they often still fail (Albornoz et al/. 2012). Prices and exports react to news about foreign markets. After the telegraph, trade flows become more volatile and, on average, larger. The average price difference across countries fell and became less volatile. The welfare gains from the telegraph are around 8% of annual trade value. The successful telegraph connection provides several advantages for empirical estimation. When the telegraph connection was established on 28 July 1866, information frictions decreased suddenly and substantially. Before that, mail steam ships were used to transmit information between the US and Europe, taking on average ten days to cross the Atlantic. The telegraph connection made it possible to communicate in almost real-time. Second, for the case of cotton, the most important transatlantic trade connection in the 19th century, it is possible to observe the information that market participants had about the other side of the Atlantic, because historical newspapers reported the arrival of news meticulously. I collected daily data on information flows from historical newspapers on both sides of the Atlantic, namely, The New York Times and the Liverpool Mercury. Together with daily cotton price and export flows, which these newspapers also reported, this unique setting and database makes it possible to analyse the effect of information frictions on trade and price patterns. In order to understand how well markets are integrated, one can check how well the ‘law of one price’ (LOP) is satisfied. This economic law states that if goods are efficiently allocated across markets, the price for identical goods in different locations should be the same (after accounting for transport costs). How well is the LOP satisfied in cotton trade? Figure 1 shows that the price difference between New York and Liverpool for the same type of cotton is much more volatile before the telegraph. 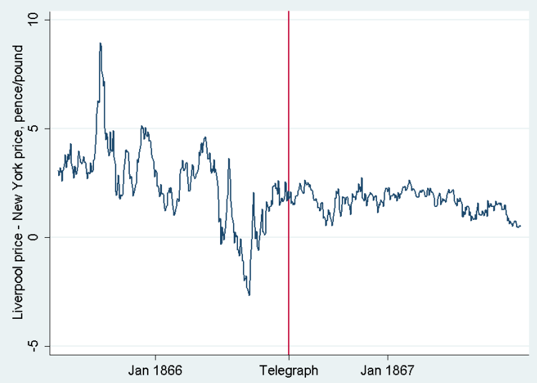 Large fluctuations disappear completely after the telegraph is established. The variance of the price difference falls by more than 90%, while the average price difference falls by a third. I show that this pattern cannot be explained by the end of the American Civil War, fluctuations in transport cost, or other alternative explanations. In fact, when just considering the steamship period (i.e. the time before the telegraph connection), faster steam ships had a similar effect on the LOP as the transatlantic telegraph. The data also show that New York prices respond to news about Liverpool prices, and as news become more recent, transmission of price changes becomes faster. A crucial question to understand welfare consequences is whether the telegraph had real effects on trade flows, or whether it just led to a redistribution of profits among market participants. The daily exports data confirm that there are real effects – exports also respond to news about foreign prices. The faster transmission of news made average exports larger after the telegraph, and more volatile. If demand in a foreign market is volatile, and exporting takes time, export decisions have to be made before actual demand is known. In this situation, merchants use the latest information in order to predict demand as best they can. Better and more recent information leads to a more precise prediction, and exports follow actual demand patterns more closely. This mechanism generates the observed pattern in exports and price differences that we observe. My findings highlight the role of information frictions in international trade. When demand fluctuations are large, and when there is a time lag between exporting and selling, information technologies that help to forecast future demand can have an impact comparable to that of the telegraph in the 19th century. The analysis of ‘Big Data’, which uses real-time information about consumer behaviour from social media and mobile phones to detect demand fluctuations, could be an example of such a technology (McAfee and Brynjolfsson 2012). Albornoz, F, H F Calvo Pardo, G Corcos and E Ornelas (2012), “Sequential exporting”, Journal of International Economics 88(1): 17–31. Allen, T (2014), “Information frictions in trade”, Econometrica 82(6): 2041–2083. Anderson, J E and E van Wincoop (2004), “Trade costs”, Journal of Economic Literature 42(3): 691–751. Head, K and T Mayer (2013), “What separates us? Sources of resistance to globalization”, Canadian Journal of Economics 46(4): 1196–1231. Jensen, R (2007), “The digital provide: Information (technology), market performance, and welfare in the South Indian fisheries sector”, Quarterly Journal of Economics 122(3): 879–924. McAfee, A and E Brynjolfsson (2012), “Big data: The management revolution”, Harvard Business Review 90(10): 60–68. Steinwender, C (2018), “Real effects of information frictions: ‘When the States and the Kingdom became United’”, American Economic Review 108(3): 657–696. Stigler, G J (1961), “The economics of information”, Journal of Political Economy 69: 213. Treﬂer, D (1995), “The case of the missing trade and other mysteries”, American Economic Review 85(5): 1029–1046. Williams, J C and B D Wright (1991), Storage and Commodity Markets, Cambridge University Press. Jensen (2007) finds large welfare gains upon the introduction of mobile phones in local fish markets, a highly perishable good. Also, the commodity storage literature describes the limitations of storage to smooth demand fluctuations because storage can never be negative for the market as a whole (Williams and Wright 1991).